StarCompliance offers powerful, customizable compliance software to automatically detect and mitigate potential employee conflicts of interest, safeguarding the integrity and reputation of global financial organizations. Whether you're already a STAR user or are just considering it, we invite you to join us in Boston or NYC for a packed half-day of problem solving and innovation! Our powerful, user-friendly software is designed to respond to the unique challenges faced by compliance and governance teams. The STAR web-based application provides rigorous, automated conflict of interest, control room, and market abuse mitigation capabilities: saving time and resources for your compliance teams, enhancing your data management capabilities, and reducing your regulatory risk. Automate the management of conflicts of interest, including personal trading, gifts and entertainment, outside business activities, and political donations – to help your compliance teams work better, faster, and more effectively. Automatically screen for employee trades completed prior to key market events, such as price movements, mergers, or acquisitions – all potential indicators of insider trading. A faster, simpler, and more accurate solution than manual insider-trading monitoring. You need to uphold your business reputation – STAR ensures your business follows regulatory compliance best practices, using the latest data and technology. You need to streamline processes and workflows – STAR saves time and resources and improves your efficiency by automating everyday compliance tasks. You need to ensure data security and a smooth implementation – STAR offers advanced data security features and is designed for seamless integration. Detect and prevent regulatory violations using a single, web-based application. Implement automated pre-approval and review processes across your organization. Save time and resources by streamlining compliance processes and workflows. Achieve a paperless compliance process. Evaluate, track, and log employee and company activity. 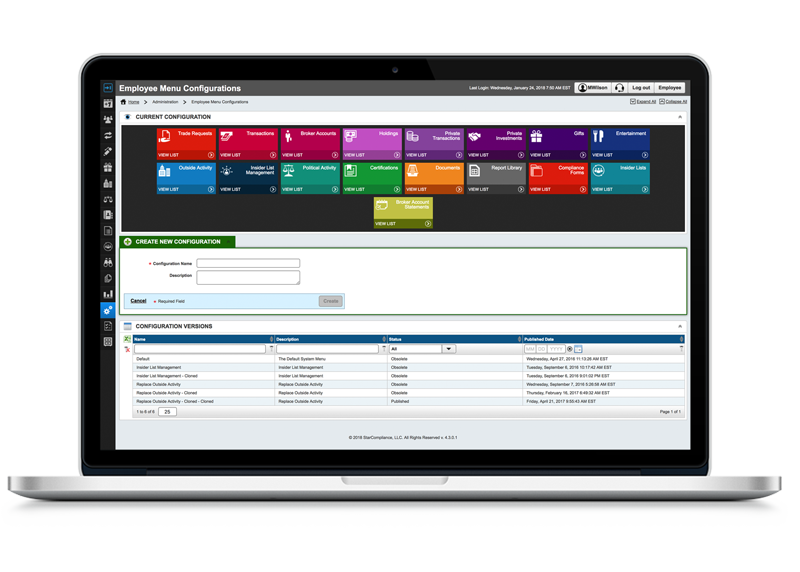 Create a user-friendly compliance management system for all end users. Today, our software is used by more than half a million employees at firms around the world. StarCompliance is a leading provider of compliance and regulatory solutions for financial services and enterprise firms. We provide compliance software with a focus on global regulations, including SEC, FINRA, FCPA, FCA, UK Bribery Act, and MiFID. If you’re looking for software with robust compliance solutions that will improve business efficiency while safeguarding the integrity and reputation of your organization, look no further. Complete the form to schedule your personalized demo today! The STAR Platform is powerful, user-friendly software with robust automated capabilities designed to respond to your unique challenges. See for yourself why more than 115 of the largest financial institutions across the globe trust StarCompliance.